"You say they'll be cool with it, but seriously, Harry, you don't know how white people can get about this stuff. I really don't want to show up to the royal goddamned wedding and suddenly the Queen, Prince Charles, and Camilla Little-Miss-Perfect Duchess of Cornwall are being all weird! I wonder what could make them act like that, huh? Oh, God-please say your brother Prince William at least knows." -"Meghan Markle"
"Furious Meghan Markle Can't Believe Harry Hasn't Told Family She's Black Yet," The Onion, May 17, 2018. https://www.theonion.com/furious-meghan-markle-can-t-believe-harry-hasn-t-told-f-1826104835. The band has a deep, sincere relationship with the Caribbean nation. But even so, Reflektor’s marketing campaign has perpetuated stereotypes. Months before Arcade Fire’s new album came out, I learned of its existence when social media pointed me to a website with some chalked, black and white patterns spelling out “Reflektor.” The designs seemed strange and foreign, and I was intrigued about what the music might sound like—not because I knew what the accompanying imagery meant, but precisely because I didn’t. This, of course, was the intended effect. It turns out those designs were inspired by Haitian veve graffiti, used in syncretistic Vodoun practices to summon the Loa (angels or spirits, messengers to the deity). But presented out of context, to the typically unknowing fan like me, they connoted something else: mystery, exoticness, esotericism. Reflektor itself—now released and at the top of the charts—and the rest of its marketing campaign went all-in on the Haitian tropes. During some promotional concerts the band donned Kanaval masks, coopting a symbol that holds multifaceted, complex meaning for Haitians during Carnival but that was reduced to flat shorthand for “party!” during a raucous SNL appearance. The music evokes similar stereotypes. 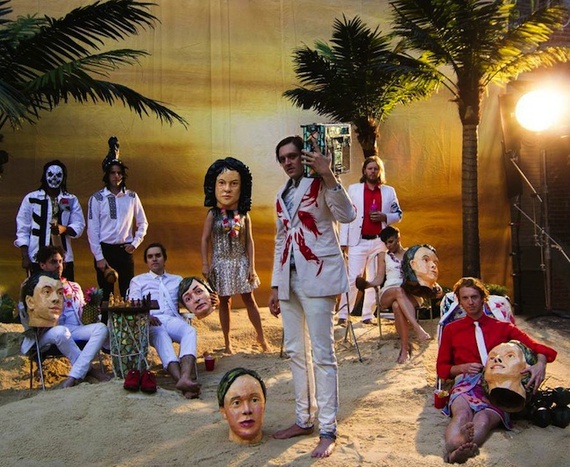 In the song “Flashbulb Eyes,” glimmering marimbas will, for many listeners, conjure a specific idealization of the Caribbean (where Haiti is located), while singer Win Butler wails about cameras stealing souls. The band’s music used to feel interesting by virtue of its heart-on-sleeve confrontation with mortality; now, it borrows its edginess by leaning on preconceptions about a foreign region….